Arianna, Woman of Pleasure is a non-player character in Bloodborne. "But...would you even take a whore's blood?" A prostitute residing in one of the Cathedral Ward's darker corners. You can speak to her at her home in the Cathedral Ward as soon as you reach the area, but she won't seek sanctuary until you have defeated at least one boss from either Cathedral Ward, Old Yharnam, Hemwick Charnel Lane or Yahar' Gul the Unseen Village. Arianna is a survivor who is found in the lower Cathedral Ward. Take the narrow stairs down from the big plaza with the 2 church giants, down the narrow sideway with the lantern enemies, to a street with 4 NPC lamps. It's the left hand door at the dead end. Asks for a safe haven when the players interacts with her after defeating 3 bosses. Tell her about the safe haven at Iosefka's Clinic OR Oedon Chapel.. Able to send her to Oedon Chapel after killing at least one boss from either Cathedral Ward, Old Yharnam, Hemwick Charnel Lane or Yahar' Gul the Unseen Village. She will teach you the "Curtsy" gesture and offer a Blood of Arianna item when you talk to her. Adella the Nun, if present, will get jealous if the player uses Arianna's blood instead of hers, and may kill Arianna after you've accepted 3 vials of Arriana's Blood while she's present. To stop Adella from killing Arianna, simply remove Arianna's Blood Vial from your inventory if you have one and take Adella's Blood; if you have Adella's Blood in your inventory when you defeat Rom, Arianna won't be killed. Or just do not accept Arianna's Blood Vial & she will still be safe. Alternatively, killing Adella will also prevent her from killing Arianna. You can't obtain her gesture or her blood if you haven't talked to her in Oedon Chapel until the Blood Moon. Like other NPCs, Arianna may be killed by the Suspicious Beggar, so it is not advised to send him to the Chapel if any NPC is present. Iosefka will reward you with 2 Numbing Mist and 1 Insight. If you enter the clinic, Arianna can be found in the main hallway gazing through a window. Drops her shoes if killed. Will not agro; Hunter must strike first. While Young Yharnam girl is in blue alien form, she will walk through the hall and WON'T attack; once Arianna dies,Young Yharnam girl in alien form will attack you. Her shoes can eventually be found in Iosefka's Clinic, suggesting she found her own way there. Can she survive? Yes, if you prevent Adella from killing her and don't kill her yourself after she has given birth to the baby, she will live with the nightmarish baby. The text when picking up her shoes after killing the baby for the umbilical cord (will kills Arianna as well). Can this NPC be an ally? Yes. After killing three bosses in the game, Arianna will ask you if you know of a safe place. Refer her to Oedon Chapel, and she will be sitting in the Cathedral Ward after the next loading screen. Follow these steps to get One Third of Umbilical Cord. After killing at least three bosses and before the Blood Moon is up, speak to her at her home in the lower Cathedral Ward. Once you killed Micolash, Host of the Nightmare, shes moves to the room between the Tomb of Odeon and Cathedral Ward lamps. Kill the infant to acquire One Third of Umbilical Cord and Arianna's Shoes. "Oh, my, what a queer scent... But I'd take it over the stench of blood and beasts any day. What is it, then? I'm off during hunts, so if that's what you're here for, I'll leave you to your own devices. If that doesn't do it, come back in the morning, darling." - for male hunter. "Oh, my, what a queer scent... But I'd take it over the stench of blood and beasts any day. What is it, then? I'm off during hunts and besides this is no place for ladies. Wouldn't want to drag you down too..." [laughs] - for female hunter. "Oh, thank you, darling. Maybe I'll see you there!" "I'd like to tender my thanks, but I haven't much to offer...all I can give is my blood. But would you even take a *****'s blood?" (If refused, or already carrying special blood): "Oh, you. I'm sorry. I'm afraid I can't help you. Unless you've had a change of heart?" "Oh, hello. The whole town's turned, has it? Quite a big family, aren't we? Though I'm afraid I seem to be the black sheep... Back for my blood, I presume." "Oh, hello. Come closer. I'm always happy to help." (after killing Rom, the Vacuous Spider) [hunched over, clutching herself] "Oh, hello there. Forgive me, I'm a bit out of sorts. So, no blood today, okay?" Arianna falls under the prophecy that is found in Byrgenwerth, "... And when the Great Ones descend, a womb will be blessed with child." So, not only does Arianna give birth to a "Child of Blood" like the Queen, the Blood of Arianna also has special properties like the Queen's. In the banquet hall where the Noble Dress is found, there is a portrait of a woman in a crown holding a blonde infant, suggesting a connection between Annalise and Arianna. Arianna can only be sent to Oedon Chapel before the blood moon is up. When the blood moon is up, you will get a message saying "No response". If you send Arianna to the clinic you can still receive a different third umbilical cord from Iosefka. It takes two Pebbles to kill the Celestial Child given birth by Arianna. I know this is 4 years too late, but after telling Arianna to go to Odeon Chapel and tricking the old man to go there as well, the old man appears there but she doesn&apos;t. What did I do wrong? what happens if you dont kill the boom boom baby? I sent her to Oedon, didn&apos;t send anyone else there because I didn&apos;t want her killed and after defeating Rom I found her shoes in a pool of blood. Checked everywhere, no demon baby. Came back after Micolash and sure enough, no demon baby. These steps/notes clearly missed something. So idk if anyone has ever had this happen but I had beaten all bosses including vicar Amelia, and the guy who gives you the stone to move on was at every home in that lane, anyone else have that happen? A bit late, but it should be noted you can’t actually talk to her in her home with more than 15 insight. Ok I’m not sure what I did wrong but i fought and defeated every boss up until Vicar and all she would say is the first quote, I only have the old lady from Yharnam and the priest lady from the Hypogean Gaol at the Church. I assumed since she wouldn’t ask for a safe place o could defeat avocado then maybe she would but apparently all the people go missing after the blood moon. What did I do wrong so I can fix it for next playthrough? Should also be noted that killing her baby kills her aswell. I thought I might have discovered something that wasn&apos;t on here, but nope. Positioning the camera right and seeing "dead" Arianna blink, was trippy. So after defeating The One Reborn if you look closely at her stomach she is pregnant. "The text when picking up her shoes after killing the baby for the umbilical cord (will kills Arianna as well)." She popped a demon baby. If i knew i would&apos;ve killed her with fire the first time i met her lol. So I read all this and finally lost whole line. For the first, my inner sense has helped me to keep Arianna alive for whole walkthrough, because I&apos;ve expected she will reward me with something more than the bottle of her blood. As condition 1: I&apos;ve met her at Cathedral Ward and she has given me her blood and been there for a while. I find out that she has disappeared only after obtaining the cord from Mergo&apos;s Wet Nurse. There is no blood near her chair or the old lady nearby is alive and still giving me sedatives, as condition 2: there was no beast in Cathedral Ward, I guess I have killed it or not triggered. Condition 3: I haven&apos;t been in Hypogean Gaol so Adella hasn&apos;t been in Cathedral Ward even though I have Arianna&apos;s blood in the inventory. Condition 4: just in case, Iosefka has been killed for being unfriendly early in game, so when Arianna asks for a safe place there was only one current option. Condition 5: just in case, Gehrman is idling in Hunter&apos;s Dream as the boss of the area. I have this following conditions on the quest, and will be very pleased if someone will tell me where exactly I am in this story and what to do next with it? 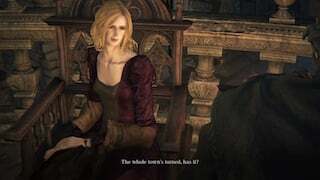 Can&apos;t send arianna to the chapel... have beaten vicar amelia and blood starved beast and ive talked to the oedon chapel dweller and the only option i still have when she asks where to go is "no". any clue whats going on? 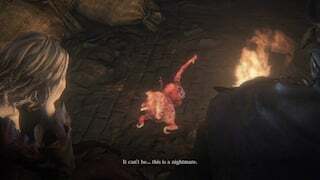 Soooooo, I did Arianna and Adellas Quest line, Adella killed Arianna and then tried to kill me, now I defeated Rom, he blood moon rose, and now I hear a crying baby all throughout Yharnam, which I hink to be Ariannas Baby, but I can&apos;t find it anywhere.. do I need to kill Micolash to make it appear or did I fail by letting Adella kill her? Information is incorrect. The statement, "You can speak to her at her home in the Cathedral Ward as soon as you reach the area, but she won&apos;t seek sanctuary until you have defeated at least three bosses. " is wrong.